Wolf’s website describes this strange, singular endeavor as an “alt food blog,” but that’s not strictly true. This is more like an alternative to a food blog. The photographs here do not depict food but rather the places where food recently was but is no longer. 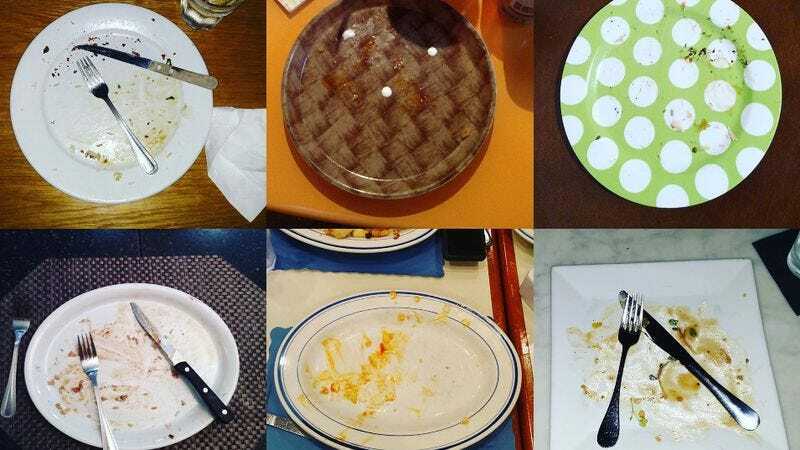 There are 150 pictures uploaded to the account so far, each one an overhead shot of an empty, just-used plate. Browsing through them gives the reader a chance to feel like a virtual busboy. It’s picture after picture of circles, ovals, squares, and rectangles. Some bear only the faintest traces of once having been meals. There are a few dollops of grease and sauce, along with the occasional soiled utensil. Others are perfectly, eerily clean. Not an entree is visible anywhere. It’s a bit like arriving at a party after all the guests have gone home. Wolf typically accompanies these haunting images with quotes about plates, saucers, dishes, and other earthenware. Dieters may despair or delight. And remember that cleaning the plate can, in the right context, be an act of great patriotism.